Several weeks ago reigning Mr. Olympia Phil Health won his fifth consecutive title. Last year’s second runner-up Kai Greene, was absent from the contest due to personal reasons. The two giants of bodybuilding had been primed for an epic showdown in the biggest bodybuilding contest in the world. The contest was created in 1965 as result of the vision of Ben and Joe Weider. Since its inception, it has featured the best bodybuilders on earth including 7-time Mr. Olympia, former Governor of California and actor, Arnold Schwarzenegger. He is often referred to as the king of bodybuilding and has inspired millions of young men and women to hit the gym and start pumping iron. Among those millions of people is yours truly. Incredibly, the last contest Arnold competed in was in 1980, more than 30 years ago. Nonetheless he still continues to inspire and draws millions of followers on social media and through interviews regarding the current state of professional bodybuilding. His evolution into action start is well-known and he has starred in some of the biggest blockbusters we have seen. His role as “The Terminator” cemented his legacy in cinema and was supplemental by other roles most notably as that of “Conan the Barbarian”. There is another side to the Austrian Oak that garners little attention but is the focus of this post. Schwarzenegger has written several books mainly regarding physical fitness and bodybuilding. This is his story of his evolution as a bodybuilder and the long arduous path he took to accomplish his goals in life. Teaming up with Douglas Kent Hall, Arnold tells his story from the beginning and explains to the reader how he reached the top stage in the bodybuilding world. The book became a national bestseller and is highly ranked among the hundreds of books on weight training. The beauty in the book however, is not the routines he gives or the explanations of certain exercises. 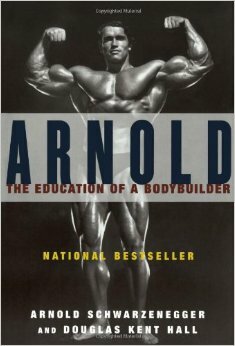 What is truly fascinating about the book is Arnold’s personal story. It is not a complete autobiography and there are several topics which he could have gone into much larger detail but would have necessitated a much longer book. Instead the focus remains on his discovery and involvement with bodybuilding and he career that ensued. Fans of the sport will find the book to highly entertaining and surprising in some ways. Behind the glory, the trophies, press coverage and bulging muscles are personal stories of sacrifice, failure and ultimately, redemption. And as Arnold himself has often said, we should never be afraid to fail. His life and its accomplishments are in many ways the epitome of the American Dream. From his humble beginnings in his hometown of Graz in Austria to the beaches of Venice in California, he continues to evolve and takes us along for the ride on the road to achieving the top crown. And although many years have passed since Arnold was crowned Mr. Olympia, he is still the king. Posted on September 30, 2015, in Biographies and tagged Arnold, Bodybuilding. Bookmark the permalink. Leave a comment.